This Chocolate Wrapper say it all...LOVE! 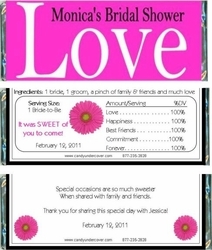 Our LOVE design candy wrappers will put you in the mood for an upcoming Wedding. Our LOVE wrappers come is a bunch of different colors. We know you will find the right color for your Bridal Shower! Perfect for Bridal Showers, Weddings and more. Chocolate is the SWEETEST favor and is sure to be a hit at your party! Order the fully WRAPPED CANDY BARS. We will do the work for you! Your Bridal Shower Favors will arrive to you completely assembled and ready to pass out to your guests.